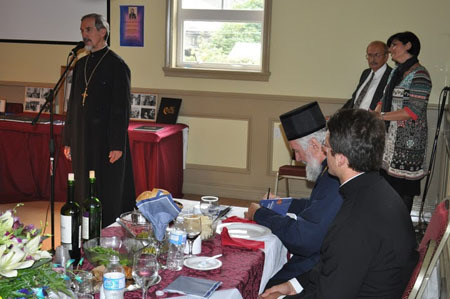 Vancouver, BC - His Grace Bishop Georgije of Canada visited the St. Sava Serbian Orthodox Church in Vancouver on October 2, 2011. 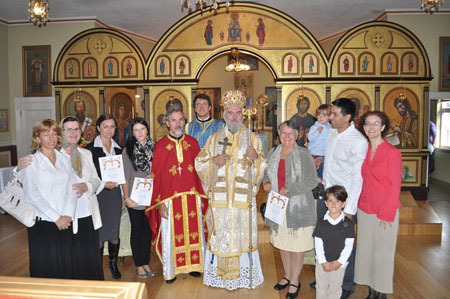 His Grace visited the St. Archangel Michael Church in Burnaby the previous day where a solemn banquet was held following the evening Vesper service. 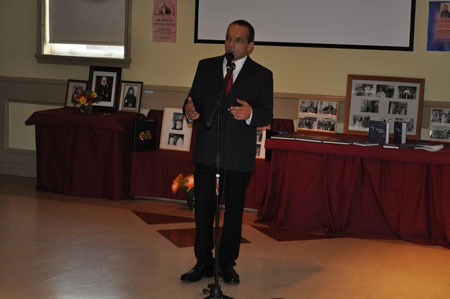 The occasion for His Grace's visit was the 40th anniversary since the founding of St. Sava church-school congregation in Vancouver. His Grace, as in previous visits, was warmly received by the honorable Serbian people. This was witnessed at the Holy Hierarchical Divine Liturgy where joining the bishop in con-celebration were: V. Rev. 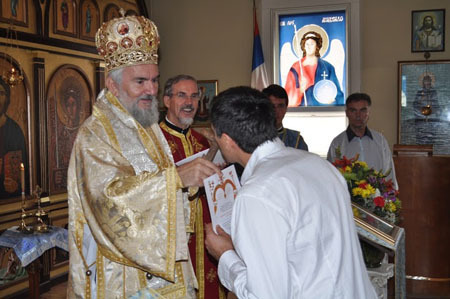 Stavrophor Miroslav Dejanov and the diocesan deacon Damjan Radojcic. The church was too small to receive all the people who attended the liturgy that day, some standing in the narthex or on the steps at the entrance. At the end of the Holy Hierarchical Divine Liturgy Bishop Georgije delivered a homily based on the morning's gospel and in continuation warmly thanked all devotees who most deservedly welcome on this day the celebration of the 40th anniversary of this beautiful church and parish community in Vancouver, but also the anniversary of Prota Miroslav Dejanov and his family and all those parishioners to whom the bishop delivered a Episcopal Gramatas. 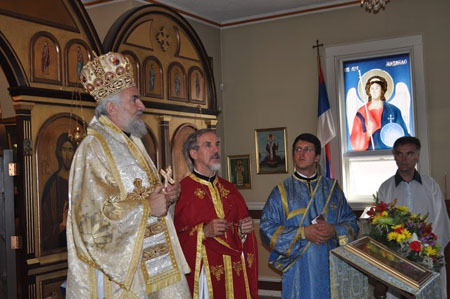 The bishop wished them many years, years of fruitful and self-sacrificing service to their Church and their Serbian Orthodox people. A formal banquet was prepared by the Kolo Sestara “Sveta Petka” at the church hall following the service. 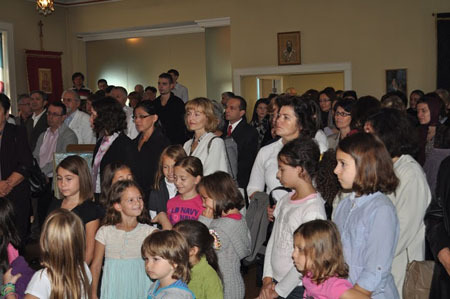 After the prayer and blessing the president of the church-school congregation Nikica Bogdanovic addressed His Grace, wishing him and all the guests a warm welcome and all celebrants of this day's wonderful day a very happy feast. Afterward the Orthodox group “St. 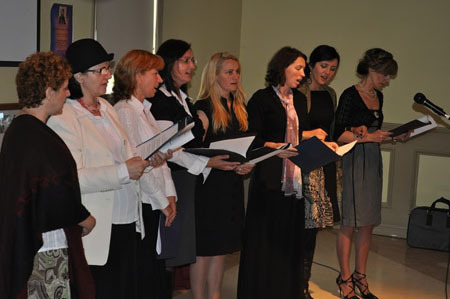 Bishop Nikolaj” sang a number of songs dedicated to Kosovo. At the very end the newest book published by Istocnik Press "Ковчежић успомена - мој пут ка Богу’’ (A Small Treasurer Chest of Memories – My Path to God) written by Bishop Georgije. Natasha Nikolic read excerpts from the book. At the end the faithful sent the bishop off with songs, wishing him a safe trip.